End of the road for Lattice sale? The Committee on Foreign Investment in the United States finally issued an opinion on the Lattice sale to a China-backed equity firm. The committee decided the sale should be rejected or suspended. The ruling comes just two days after Lattice said it was considering a direct appeal to the President. Read more from the Oregonian. Another utility proposes renewable energy investment. This time it's PacifiCorp with a $3.5 billion proposal for new wind farms. The Public Utility Commission has a familiar reaction. 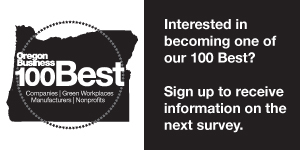 The Portland Business Journal has more. Groundwater still an issue. Remember the Oregonian's investigation into Oregon's water resources? That series is a year old, and nothing has changed. The Water Resources Department still cannot say how much groundwater is available and how much is being pumped. Read more from the Oregonian. Oregon Health Authority completes Medicaid eligibility review. The agency said it finished reviewing the final 115,233 enrollees just before its Thursday deadline. Of the final members checked, only 60,353 were still eligible for Medicaid. The Bend Bulletin has more. That's not all for OHA. Director Lynne Saxton resigned amid a communications scandal (more on that here). Now it looks like there's more cleaning house in store for the agency. Directors of health systems and external relations divisions are on the way out; so is the director of operations and finance. OPB has the story. Salem wages surpass recession. Residents earn more per year on average than before the recession. Salem workers earn $42,048 annually as compared to $40,657 in 2006. The Statesman Journal has more. On the subject of wages: a women’s equal pay group debuts in Portland. OB Research Editor Kim Moore attended the launch of Ladies Get Paid. "It is a sad and frustrating fact that women are 60% of today’s college graduates," Moore writes, "but less than 22% make it past middle management." Most Popular. Stories about immigrant workers, workplace efficiency and the eclipse top the most popular list for August.